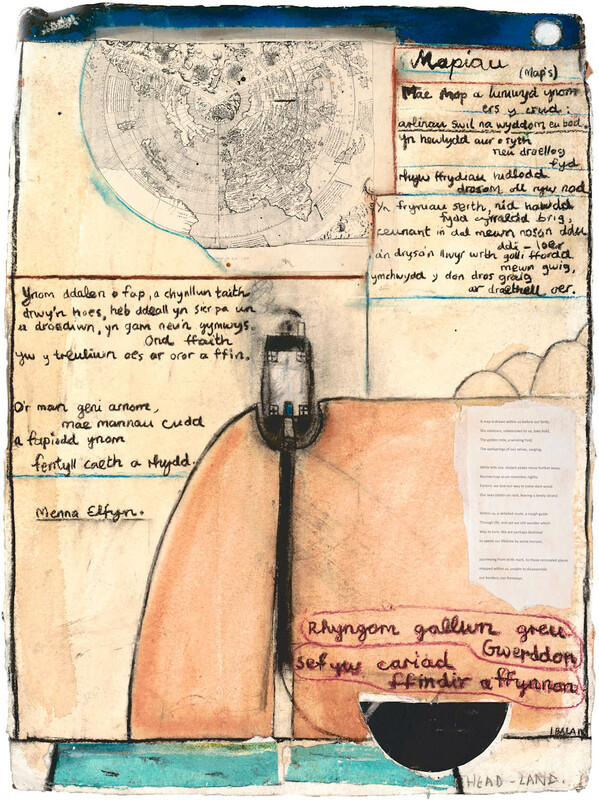 It’s not often that charcoal and ink are used in anatomy, but Iwan Bala‘s exhibition, Field Notes – Noddiau Maes at Oriel Myrddin in Carmarthen show how this can be done. 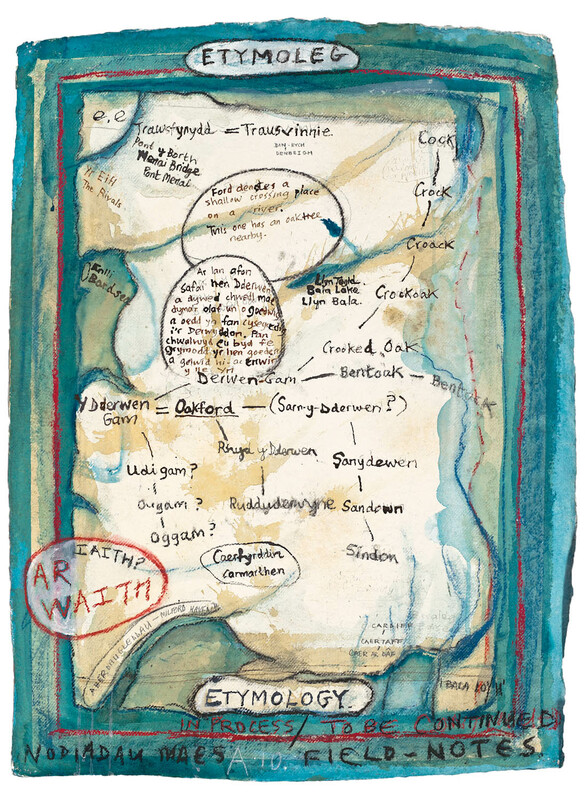 Collaborating with poet Menna Elfyn, Bala has set about the many tissue layers of Wales, peeling them back to expose meanings; double meanings; family names; place names; story; history and the multiple senses of place that go with the territory of understanding what it is to live in Wales. In the accompanying catalogue (a modest £7.50), Menna Elfyn relates the simple story of a woman, about to be displaced by the M.O.D’s clearance of Epynt to create a firing range. She asks if she can take her front door with her. Emblem of home and a family’s historical continuum. It’s easy to dismiss work so rooted in place as parochial or somehow not quite in the broader canon of contemporary practice. But I’d argue that this work, while Wales-specific in its content, is equally universal. Anywhere in the World where there has been displacement, disturbance, threat; where language is the last bastion of memory and identity; where the future is conceived in the past – that’s where this work belongs. 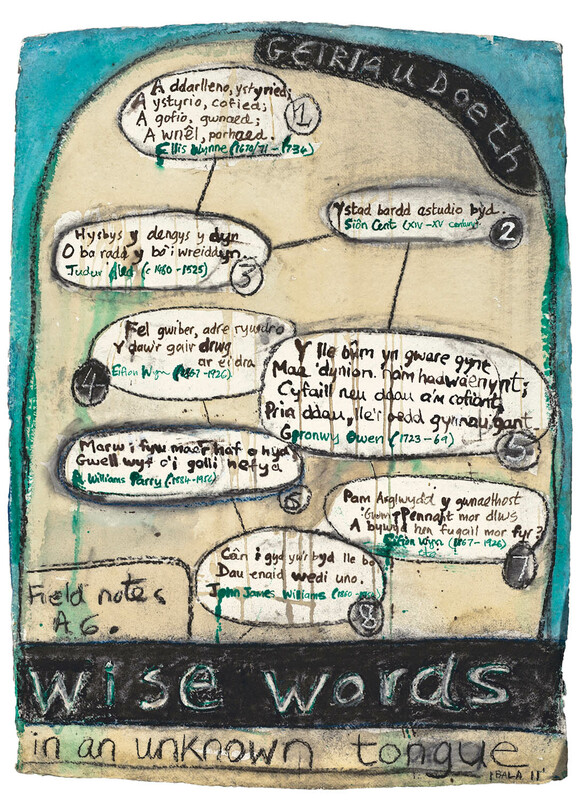 I’ve written about whether the welshness of an artist is important here but it’s all in the context. Had Bala and Elfyn been from somewhere else, drawing/painting and writing about Wales, the work would be a colder, more subjective response and the real poetics of this careful dissection would be missing. 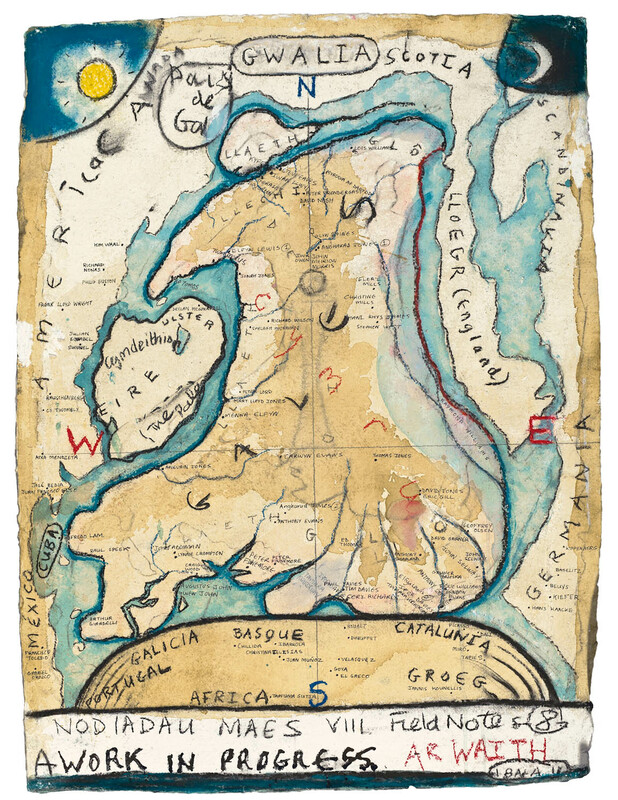 Here the handwritten notes, the earth colours and lyrical maps seem to come straight from the heart, via the brain pathways of analysis, memory and personal response and directly down to the hand and onto the page. Along with the dissection, Bala goes beyond his examination of place to lay out the seeds of a broader manifesto for artists and poets – roles and responsibilities that would flummox any Human Resources director, but make perfect sense. The show continues until 18 February 2012. I strongly recommend that you have a look for yourselves and, while you’re at it, buy the catalogue from the shop-that-saved-my-Christmas. 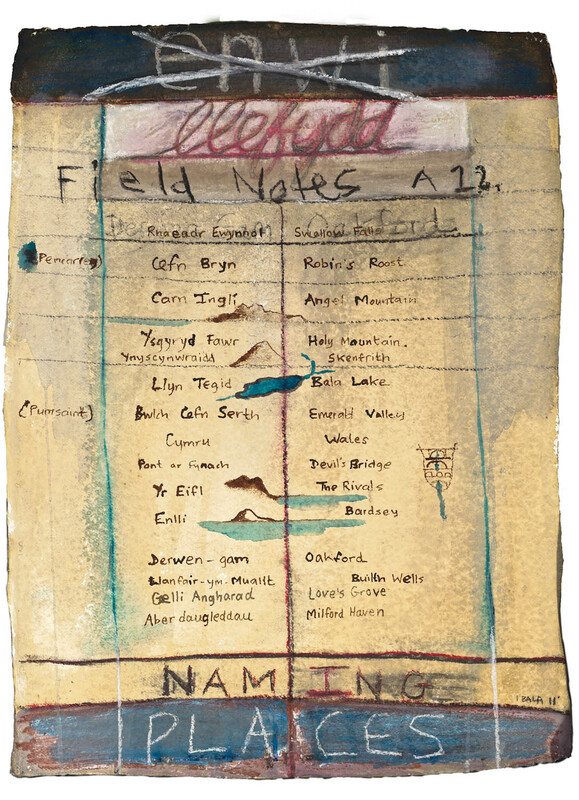 There’s a Culture Colony video that’s a record of the presentations at the opening of Field Notes, given by yr Athro M. Wynn Thomas and Dr. Menna Elfyn who also reads one of her poems. Both speakers use Welsh and English, translating as they go. 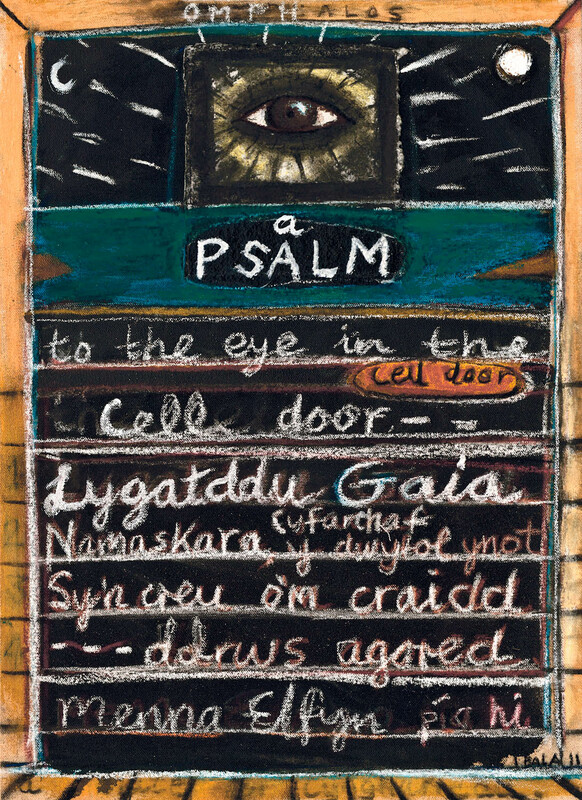 This entry was posted in Art in Wales and tagged Field Notes, Iwan Bala, Menna Elfyn, Oriel Myrddin by Emma Geliot. Bookmark the permalink. , politics ever evolving, but like the review said not unique to Wales.This is true for the accompanying booklet tells a story of a woman being removed from her home turf, which brought to mind a story of displacement in the middle East. Palestinian women still have the keys (large ornate ones) to their homes after all this time, the desire and almost Salmon like primitive instinct to return home is universal, as is A Forensic Poetry ……..Field Notes. I really like how they look as well (via computer) as much as I could tell, they could be Darwin’s field notes from Galapagos Islands or some other eminent scientist.! 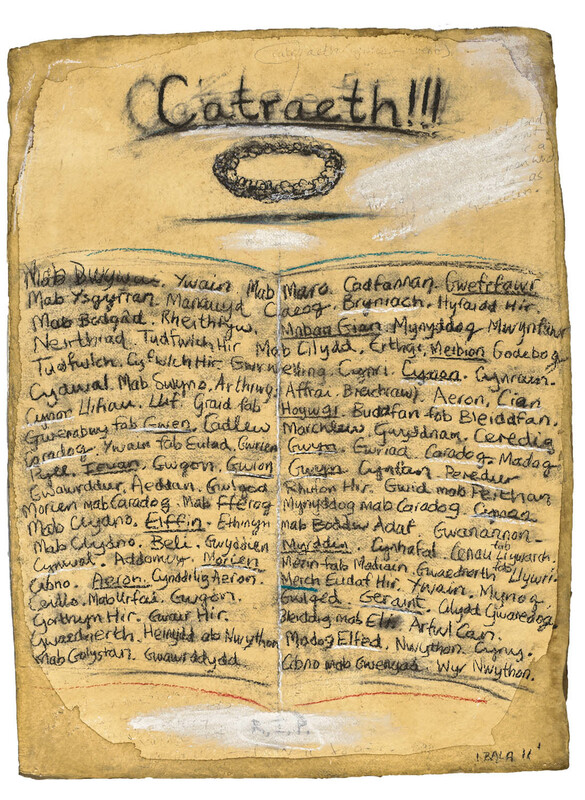 …very much looking forward to your exhibition at Wales Millennium Centre! Saw this exhibition in Wexford -LOVED it! Even though all the welsh bits were lost on me. Visually it was stunning.